I’ve been thinking deeply about the mind programming which created the mystique around the Californian Mount Shasta as part of psychedelic era of the Sixties which had the aim of creating the New Age movement (as it was named by the Scottish Rite of Freemasons) and to where it’s led us to now. This will, one day, be told by the wandering storytellers, the Great Saga of the Baby-Boomer Generation, which, right now, is being gradually unravelled and unwound like the red thread of Ariadne which will guide us out of the labyrinth of mind control. 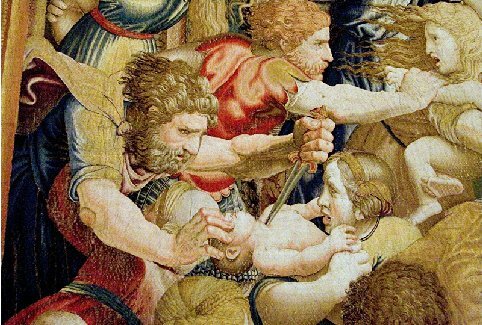 One of my spirit guides, name of David, has been talking to me lately about Herod’s Slaughter of the Innocents in Matthew 2. It is a story which is told in many cultures in many different ways, but with the common theme that the king is so afraid of being overthrown by the next generation, he kills them all at birth. In the Old Testament book of Exodus, we read about how the baby Moses was hidden in the bulrushes of the river Nile by his mother, to escape the Egyptian pharoah’s massacre of the innocents. We read in the Gospels of the New Testament about how the baby Jesus had to be secreted away into Egypt, to avoid King Herod’s own massacre of the innocents. In the Indian Srimad Bhagavatan, the baby Krishna has to be fostered with another couple, to evade King Kamsa’s massacre of the innocents. And in The Once and Future King by T H White, the young King Arthur is raised by his uncle, Sir Ector, to hide him from Uther Pendragon. We also find a similar story about the god Zeus, in Greek myths. Zeus’s father, Chronos, was chief among the gods and he had been warned that one of his children would overthrow him by killing him. Chronos knew this must have been true because he had overthrown his father in the same way. So Chronos ate all of his children as soon as they were born. But as soon as Chronos’s wife Rhea had given birth to Zeus, she wrapped a stone in swaddling clothes and gave it to Chronos to swallow instead. She then hid Zeus in a cave until he was old enough to overthrow his father. And so the Slaughter of the Innocents is unlikely to have happened in a historical sense. And what I’m being guided to realise is that the Slaughter of the Innocents is a metaphor for what happened to the baby boomer generation, and any other generation that brought hope of liberation from the controllers to this planet. In our case, they saw us coming, a whole generation of which the core was made up of some highly-evolved sensitives and embryonic spiritual teachers and guides – and so they laid down traps to ensnare us. The CIA project, code-named MKULTRA, began in the early 50s, and only was officially closed down in 1973. It’s prime modus operandi was to kidnap young children (remember all those missing children on the milk cartons?) and feed them high concentrations of psychedelic drugs and then brainwash them. Long before LSD had hit the streets, that was their main drug of choice, but they also used other forms of chemical poisoning, plus hypnosis, sensory deprivation, isolation, verbal and sexual abuse and torture. Once the CIA were happy with the results they’d achieved in vitro, they released the same form of mind programming into the wider world. The generation of babyboomers was in the front line, in the Sixties, as suddenly LSD appeared, as if from nowhere, and we were encouraged by various CIA-trained ‘gurus’, like Timothy Leary, to use them a basis for spiritual enlightenment. Of course, we know that shamans use psychotropic herbs, like ayahuasca and peyote, in the jungles of Central America to go into trance. But unlike the lab-created chemical of LySergic acid Diethylamide, the herb is used in its organic, natural state, so that the spirit of the plant is still present. Central American naguals also use their indigenous psychtropic herbs in structured, ceromonial settings which provide some sort of spiritual protection for the initiate. This is all a million miles from Jimi Hendrix being given acid to hand out to the front row of revellers at the Isle of Wight festival in 1970. Friends of mine took years to recover from the “bad trip” Jimi’s acid induced; one went into a mental home, temporarily. I heard of others who killed themselves. The snares were effective and most of us walked into them eagerly because we were traumatised by this incarnation. Even for those of us who lived fairly uneventful lives, it takes a long time to recover from the trauma of being born into the Fifties – characterised as it was by another trauma, the trauma our parents were only just recovering from after the Second World War. Many of us have tried to mitigate this trauma by not really being here. Well, speaking for myself, I spent decades trying to find a way up, back to my star family constellation, and out of this density, when all the time, the real answer lay in trying to find a way down and in. There followed a serpentine path of diving in and out of various spiritual disciplines, all with the aim of getting up and out. All of these paths and gurus were encouraged by the latter day Herods, who had a vested interest in this generation never connecting properly with the Earth. I’m sure of this now. Well… I won’t go on… I’ve told this story many times, how I managed to discover this truth through shamanism, that the Earth is our mother for this incarnation and that she will heal us and empower us and make us strong. So we need to ignore all the snares of those who want us to concentrate upwards. Oh yes, and the other thing they always tell you is that you will never be good enough (characterised by Christianity as Original Sin) until you meet your Maker in the Heavens. This is how we are controlled by the ice-cream of the three Abrahamic religions ~ Judaism, Christianity and Islamc. Whichever flavour we choose ~ chocolate, strawberry or tutti frutti ~ it’s all from the same maker and the same controller. And their missionaries made sure that even the Eastern religions have become infected with that way of thinking, also so that yoga and the raising of the kundalini is always about going ever upwards to the crown. Of course, they have to keep changing the stories as we get wise to them, and so the latest one is Ascensionism. It’s exactly the same as the Christianity one, except there’s no Jesus. The aim though is the same, by focussing our attention upwards and away from the Earth to gain superior, 5D crystalline bodies, we will lose power through losing our connection the Land of the Earth, and thus be more easily malleable by the Herods and Kamas. Without those long, spiralling deep roots to hold us in unity, we can be so much more easily divided, conquered and enslaved. So this I believe is the story of this massacre of the infants, which began with Aleister Crowley, Jack Parsons, Ken Kesey, Timothy Leary at locations such as Pasadena, Montauk, Mount Shasta and the Overlook Hotel at the beginning of the Sixties. (For more about which, see further reading below).